Antique BOOTHS 'Silicone China'. Small Size Tea Pot. Small Tea Pot. Sugar Bowl. Strainer Bowl. Circa1906 Factory Back Stamp. Excellent Antique Condition. A lovely set in good condition for it's age. It is free of stains but may have minor imperfections such as scratches, trim wear or crazing. 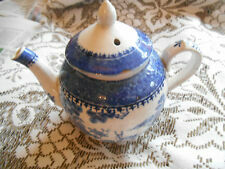 For sale is an art deco teapot made by Booths, England, in the Netherlands pattern. It features a multicoloured hand-painted flower design. This is most likely a 1 pint teapot. Printed on the bottom says "Booths, M, Silicon China, Made in England "Netherlands" A9718 [Embossed - Rd 705778]". 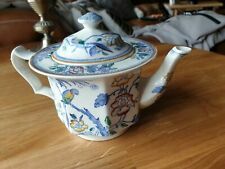 DBC " WESTOVER " Vintage oriental design teapot tea pot. LOWESTOFT DEER DESIGN. UNDERNEATH SAYS LOWESTOFT DEER RD.NO. BOOTHS TEAPOT. BLUE AND WHITE. AND APPROX 6" WIDE FROM END OF SPOUT TO WIDEST PART OF HANDLE. IN VERY GOOD USED CONDITION. 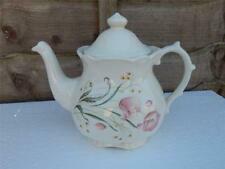 Booths China Teapot with Floral Pattern c1920s. Dispatched with Royal Mail 2nd Class. Make Supersized seem small. 'June Flowers'. Get images that. 5" high without the lid. Pattern is Booths British Scenery Made in the UK England and style numbers A8024, 6508 and BOOBRSP. Pink Grapevine and Scene. Object Type Teapot. Model British Scenes.